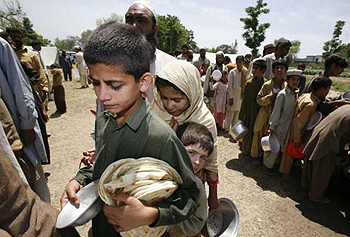 Refugees queue for food at a camp in northern Pakistan. Pakistan has the world's attention these days, not only because of the flooding but also because of its terrorist activities. The ever-deteriorating situation and political tussle along with the deep-rooted radical mindset are taking a huge toll on Pakistan. Radical forces think that jihad against India is more important than aid to Pakistani flood victims. The United States has asked Pakistan to accept Indian aid for flood victims, and there should be no role for politics in disaster. But Pakistan, so far, has not accepted the offer. At the same time its leaders have been sending an S.O.S. to the international community for more aid to meet the immediate needs of its millions of flood-affected people. Due to such suicidal politics, Pakistan had to face embarrassment when British Prime Minister David Cameron on his India tour blamed Pakistan for its dual role in Afghanistan and accused it of supporting the Taliban. He also said that his government would not tolerate the double standards of Pakistan and its support of terrorism in Afghanistan, India or any other part of the world. This truth didn't go down well with Pakistan, and the ISI head Shuja Pasha cancelled his British tour. It is to be noted that ISI officials were supposed to go to Britain to attend a meeting on "cooperation against terrorism." Pak-born terrorism is a matter of concern for the whole world, especially including India and South Asia. The United States is certainly one of the most concerned parties. The. Despite the U.S. financial and military aid to Pakistan to combat terrorism, the Taliban's power is increasing. For this, Prime Minister Cameron isn't the only person questioning Pakistan President Asif Ali Zardari and his government's efforts to fight terrorism. In addition to charges of nexus with the Taliban, Pakistan has been providing shelter for many terrorist organizations for decades. India has many times uncovered secret terrorist training camps in the Pak-occupied Kashmir and in Pakistan itself. Not only have many areas in India been affected by this, Pakistan is itself a victim. After using the poor, illiterate and unemployed youth in terrorist activities, the extremist and fundamental forces in Pakistan are now using innocent children. Children are being introduced to AK-47s, bombs and suicide-attack training. Parents are paid a meager amount of money and told that their child will become a victor or a martyr, which in either case will get the child into Heaven. Since its inception, Pakistan has suffered instability. Military coups have thrown out democratically elected governments. A prime minister has been hanged. Just three years ago, then-Prime Minister Benazir Bhutto was assassinated. Pakistan has also witnessed military rule, emergency and marshal law. Today the condition is so bad that hundreds of Pakistani soldiers are being kidnapped by the Taliban. Either terrorists have become stronger than the Army or, according to the fears of David Cameron and other world leaders, it is due to Pakistan's dual politics and conspiracy. Both situations are not only shameful but also suicidal for Pakistan. Tanveer Jafri is a columnist based in India who has been published in dozens of newspapers and portals in India and abroad. Jafri is also a devoted social activist for world peace, unity, integrity and global brotherhood. He is a member of Haryana Sahitya Academy and Haryana Urdu Academy.